The formula for De Palma is simple. For just over 100 minutes, filmmaker Brian De Palma sits in front of a fireplace and briefly explains why he made his films, how he made his films and how much money his films made. From Carrie (1976) to The Untouchables (1987) to The Bonfire of The Vanities (1990) and beyond, the template is repeated over and over again. The reason it works is because there’s something hypnotic about listening to filmmakers unabashedly discuss their own work. The documentary, by Noah Baumbach and Jake Paltrow, breezes through De Palma’s early life because it knows that we bought a ticket to hear the filmmaker discuss filmmaking. Baumbach and Paltrow are friends with De Palma, as well as admirers of his films, and it shows. I don’t know that the Brian De Palma presented in the documentary would talk about this stuff with just anybody. 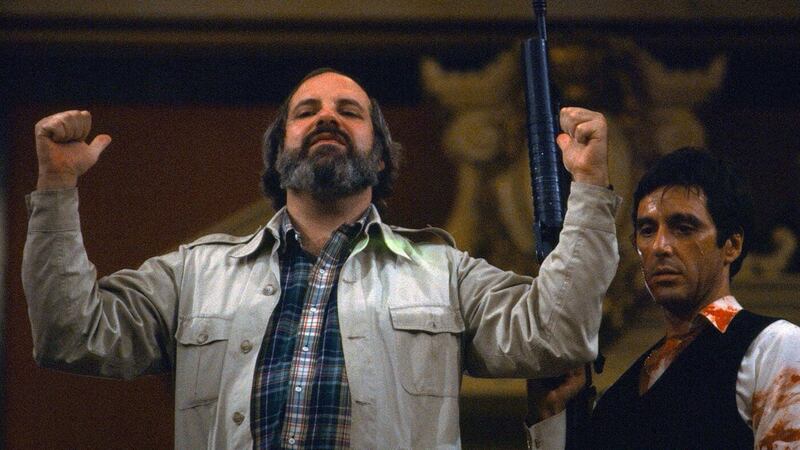 Throughout the entirety of De Palma, De Palma’s is the only voice we ever hear…for better or worse. The decision to let De Palma do all of the talking means that the filmmaker is able to contrarily self-deprecate and self-aggrandize. He essentially explains that he’s always been a journeyman filmmaker but then refers to himself as an “interpretive” director…whatever that means. He admits that he’s always valued style over substance, but then decries critics who claim his films lack substance. Unfortunately, he’s even allowed to go unchallenged after shrugging off long-standing claims that his films are misogynistic. It would have been nice to see Baumbach or Paltrow press De Palma a bit, especially since he doesn’t seem like a particularly introspective person. Still, discussion of how his bizarrely diverse filmography took shape is enough to carry the documentary. Tidbits about how he discovered Robert De Niro and what a nightmare it was to direct Cliff Robertson (who intentionally tried to derail the performances of his costars) reveal some juicy stuff. The best moments in De Palma are when the filmmaker discusses his failures, namely Scarface (1983) and The Bonfire of the Vanities. Although Scarface is now considered a classic, it underperformed critically and financially when it was released. The Bonfire of the Vanities was…well…The Bonfire of the Vanities. By now, it’s only remembered as a complete disaster. De Palma doesn’t seem to think either film was bad, he thinks they were just “okay,” which is, somehow, much more fascinating. In general, I dislike De Palma’s films, and yet I thoroughly enjoyed listening to him talk about them. De Palma is the type of documentary that should be required viewing for anyone interested in filmmaking because it offers a look into a medium from one of the directors who shaped it’s current state. Obviously, I wish De Palma had opted for more insight instead of straight-up “hero worship,” but at least the documentary worships a hero with some terrific stories to tell.